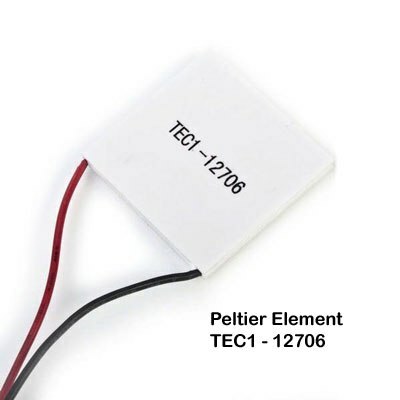 Peltier is a Thermoelectric device used in cooling applications. 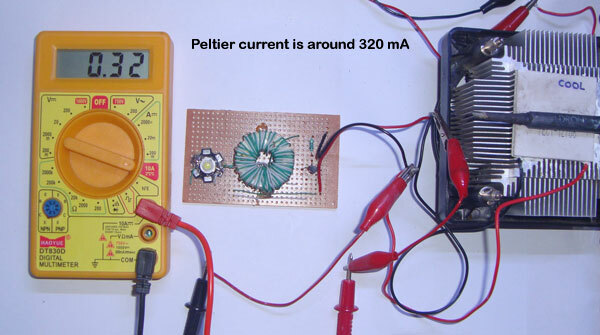 When we provide more than 500 mA current to Peltier, its one side cools and the other side turns hot. This is due to the transfer of heat from one side to the other. When we reverse the Polarity, the heat flow reverses and cold side becomes hot side and vice versa. But we can reverse the function of Peltier. That means, when the Peltier is heated, it generates current. If the temperature on one side of Peltier increases above 60 degree, around 1.5V at 400 mA current will be available from the Peltier. 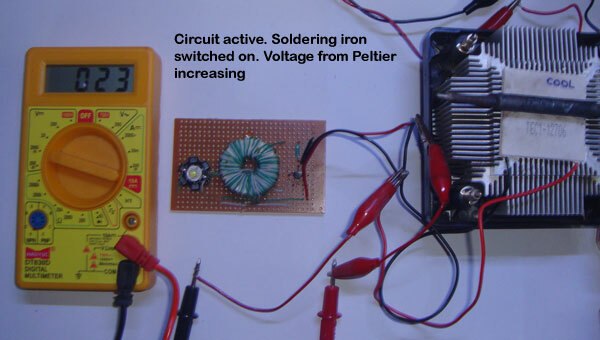 Peltier generates Positive or Negative volt depending on the Polarity of wires. 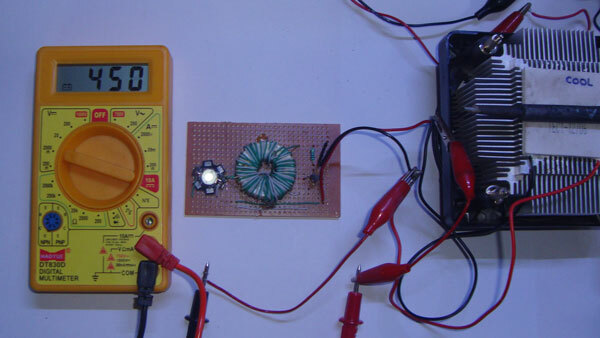 If we check the Peltier with Multimeter, sometimes it shows a –ve voltage ( E.g. -180mV). If we reverse the Polarity by changing the wire (Red wire to Black probe of meter and Black wire to Red probe) the voltage from Peltier becomes Positive (180 mV).So after fixing the Peltier on Heat sink, check the voltage from the Peltier. If it is negative, reverse the wire connections to get positive voltage. 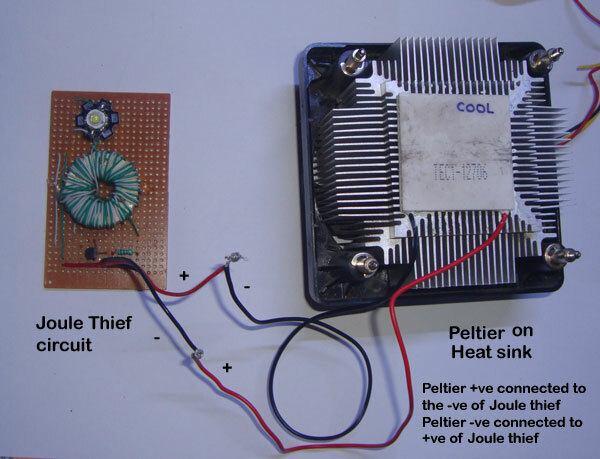 Peltier needs a large heat sink to dissipate heat. Heat sink compound should be applied to one side of Peltier before placing on the Heat sink. 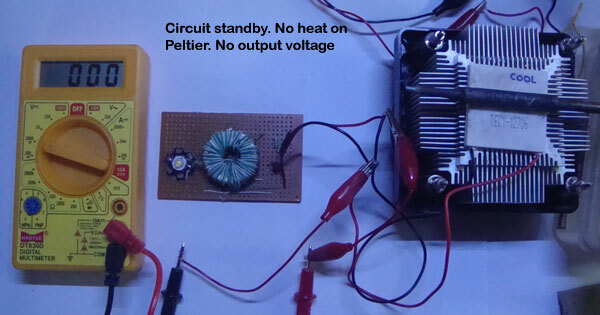 Without a heat sink, Peltier will be damaged during high current flow. A Computer Heat sink with Cooling Fan is an ideal choice. When you purchase a Peltier, first identify its Cold and Hot sides. Connect it to 1.5V Pen cell. After few minutes, one side of Peltier cools. Mark this side as Cold side. 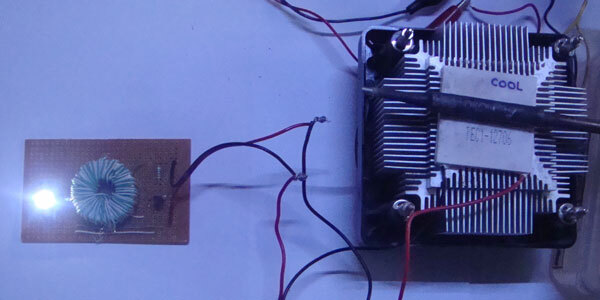 For making Cooling devices, the cold side should be on top so that, heat will pass to heat sink. 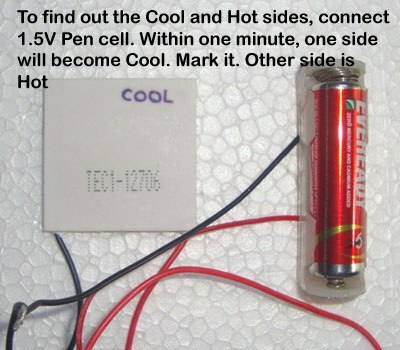 If you want to make a Heating device, change the sides of Peltier or simply reverse the Polarity of wires. 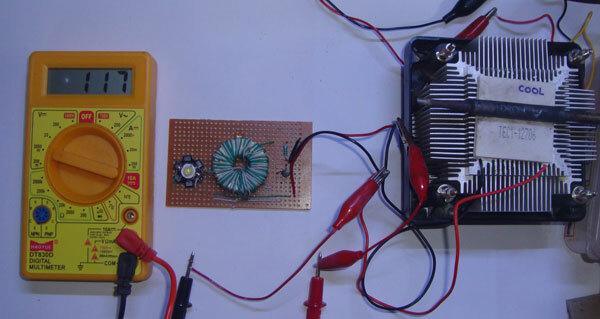 First make a Joule Thief circuit using 1 watt White LED or any LED you like. 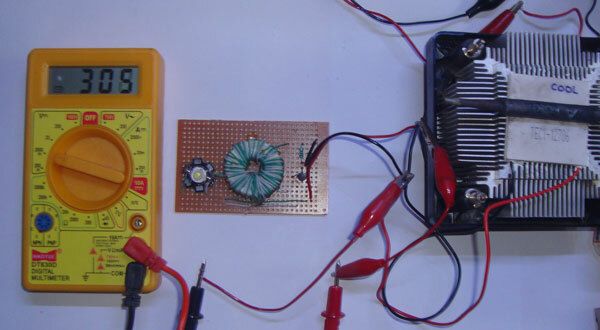 For winding the Toroid and connections of Joule Thief, go to this link. Take the Peltier and apply Heat sink compound on one side. Place it on the Heat sink. 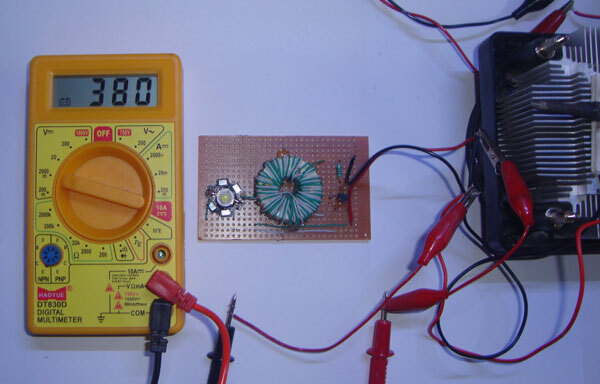 Connect Multimeter to the wires of Peltier and shift the meter to Milli volt range. Then press on the Peltier surface with hand. You can see the voltage in the meter. If it is a Negative voltage (E.g. -15 mV), reverse the wires to get Positive voltage. 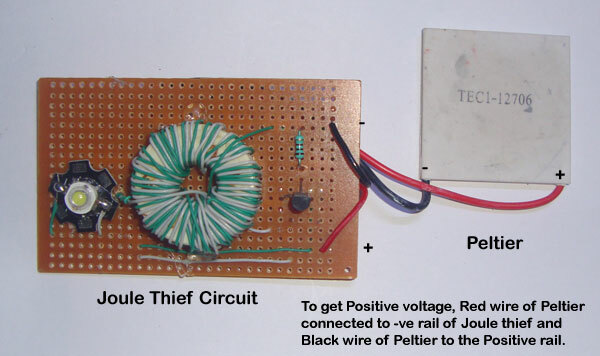 Connect the Joule thief circuit with the Peltier. That means, the Peltier is now like a battery. 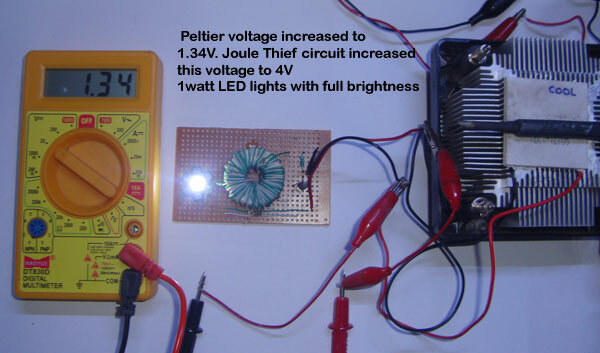 Remember, the polarity of voltage from Peltier should be similar to the Positive and Negative rails of the Joule Thief. Then place a Soldering Iron tip on the surface of Peltier. You can directly place it because the Peltier is protected with Ceramic. Switch on the Soldering iron. When the voltage from the Peltier increases to around 400 mA, White LED starts to glow. 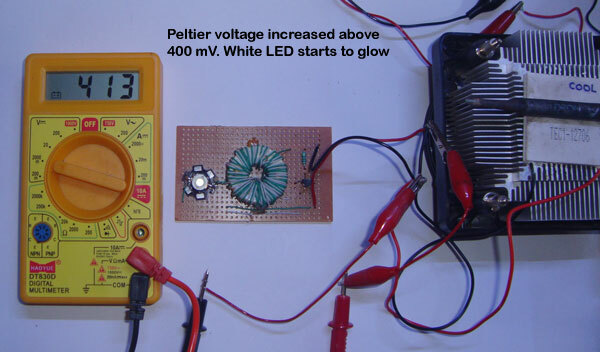 Peltier voltage increases to maximum around 1.6V. At that time current will be around 400 mA. If you connect 5 Peltier in series and heated, it generates around 7.5V at 400 mA. In this case, you can charge a Mobile phone from it.